In past, Japanese scientists have already succeeded in transmitting energy wirelessly, in a key step that could one day make solar power generation in space a possibility. Researchers used microwaves to deliver 1.8 kilowatts of power—enough to run an electric kettle—through the air with pinpoint accuracy to a receiver 55 metres (170 feet) away. In another development of wireless energy devices, the scientists in China have developed a new method for connecting energy devices without using wires. Not only are the devices easy to make, they continue to work even when bent or twisted - a vital trait for flexible electronics. Traditionally, energy devices involve modules connected in a series by electrically conducting wires. Although this is the standard system, fabricating such devices is complicated and costly, and the risk of short circuits means these devices also pose a serious safety hazard. These difficulties are well understood by Hao Sun, a scientist at the Fudan University in Shanghai, China. 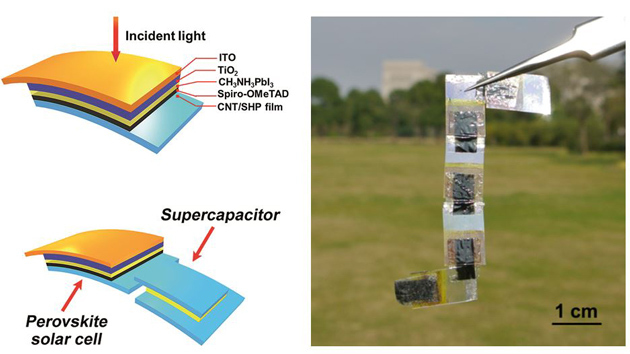 Sun used to make flexible electronics in the conventional way: 'I found the connecting process quite time-consuming and complex, as well as the sacrifice of the flexibility and integrated level of the resulting module,' he says. This drove Sun and his co-workers to come up with a better way of connecting modules - by combining electrically conducting carbon nanotube sheets with a self-healing polymer. Overlapping the edges of the modules then pressing them together initiates hydrogen bonds in the polymer to fuse the molecules together. This fusing process, which takes only a few seconds, connects carbon nanotubes in the different modules, allowing a current to pass between them. You can get this article free by clicking below link until 31 August 2015.